The past several model runs have been developing a low off of the Southeast coast early to the middle of next week. It may be a tropical or hybrid system. The pressure gradient is keeping a strong flow into the Mid-Atlantic coast from the northeast. High surf and rip currents will increase into the weekend and continue into next week. Last edited by Caribbean Traveler on Fri Sep 26, 2008 12:34 am, edited 2 times in total. The forecast models still try to develop some type of hybrid low off of the Southeast coast by the middle of next week. Look for periods of windy weather on the Mid-Atlantic coast with rough surf and strong rip currents. The gradient will stll produce brisk conditions even if the low is not a strong one. The forecast models continue to develop a subtropical system around the middle of next week off of the Southeast coast. Winds and surf will build again at that time. There is a tweak to the forecast. The models still call for a weak low to develop off of the Southeast coast this week. This will keep the gradient winds up on the Mid-Atlantic coast with rough surf and strong rip currents. The change comes in as a new tropical system is developing near Puerto Rico. It appears now that this will be the dominate feature. It is forecast to move near the Mid-Atlantic coast by late in the week. Winds should pick up on the Outer Banks tomorrow as a low develops off of the coast. Models drift it southwest slowly over the next few days, but keep it off of the North Carolina coast. Winds will increase on the Southeast and Mid-Atlantic coasts into Wednesday. Rough surf and strong rip currents will increase. Seas are generally 8-10 feet off of the Southeast coast. Visible satellite imagery does not show a low center yet. Buoys also indicate winds are either ne or ene with gusts to about 35 mph. Forecast models still call for a low to develop by Wednesday and move inland over North or South Carolina in a few days. This sytem would be either a non tropical or subtropical low. Strong ne winds will keep surf rough and rip tides strong especially from the Virginia coast to the Outher Banks of N.C. Developing Nor'easter or subtropical storm? The system off of the Southeast coast that has started developing showers and storms are becoming more concentrated east of North Carolina. The big question will be, is it a Nor'easter or subtropical storm? Right now there is a upper low over the region. It will have the characteristics of a Nor'easter with strong northeasterly winds that cause significant impact on the coast. These effects will include: beach erosion, strong winds, heavy surf and heavy rain. If it gains some tropical characteristics like a warm central core or banding, it may be called a subtropical system. If it is subtropical, it gets a name. If it is a Nor'easter, it doesn't get a name. The effects will be identical. Our guess is that NHC will name it a subtropical sytem by later Wednesday. The strong winds and roughest seas will be off of the Virginia coast and Outer Banks of N.C. Watch for southwest sound flooding in the sounds on eastern N.C. as the water gets blown that way. The gusty winds will spread up the Mid-Atlantic coast during Thursday and affect the New Jersey and New York coast line with rough surf and winds. The system is forecast to move west, inland in North Carolina late Thursday. It appears that our earlier question has been answered. 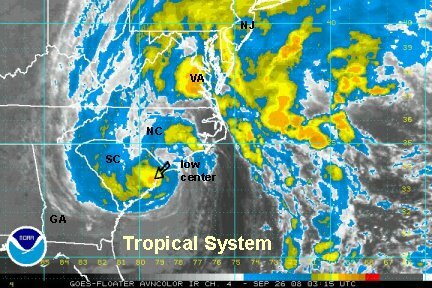 This system will become the next subtropical storm. NHC would go straight to a storm on this one since winds are estimated at 65 already. It may also acquire enough tropical characteristics to be called tropical before it makes landfall. Look for NHC to upgrade today. 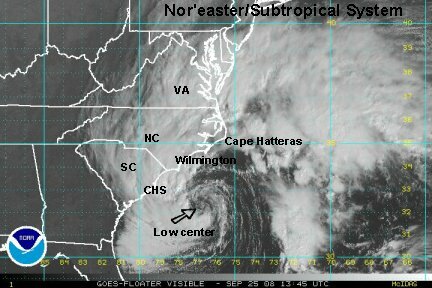 Satellite imagery show a quickly developing low centered about 225 miles southeast of Wilmington, NC. The surface circulation is now under the deep convection and further strengthening is likely. Heavy rain is just east of the Outer Banks. Seas are in the 10-20' range well offshore. The forecast calls for a short lifetime for this system. It should make landfall by late Thursday afternoon. Heavy rain, beach erosion, and gusty northeasterly winds will continue to pick up on the NC/VA coasts today. Rainfall will likely be 5"+ in the heavier bands. Thursday a second band of rain will develop on the northern side of the storm and affect the Mid-Atlantic coast from Maryland to New Jersey. This heavy rain and wind will spread into New York City and across Long Island by late Thursday into Thursday night. Rainfall with this band will be in the range of 1-3". A band of very heavy rain is spinning about 100 miles offshore of the Outer Banks. The surface low has become a bit exposed on the eastern side of the circulation. Seas are at 14' with 45 mph winds at Diamond Shoals east of Cape Hatteras. Some gusts are near hurricane force farther east per NHC. The Subtropical / Nor'easter whatever is located still over 200 miles southeast of Wilmington, NC. A wide heavy rain band is about 50-100 miles east of the Outer Banks southward to offshore of Bald Head Island to east of Charleston. Winds at a buoy at Diamond Shoals east of Cape Hatteras continue to show winds gusting to 45-50 mph with 14' seas. Seas are up to 20' farther offshore. Look for the heavy rain to move into N.C. overnight tonight with some totals over 5". The winds will pick up farther north Thursday as the gradient wind intensifies. Rain and wind will increase on the Mid-Atlantic coast from Maryland to New York on Thursday. Rainfall will be 1-3" in the heavier bands. 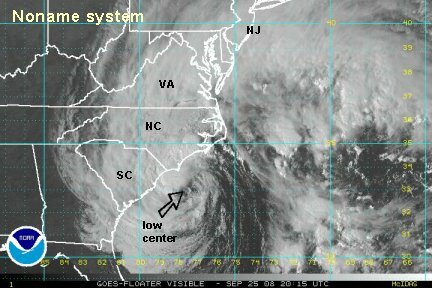 The low is still predicted to move into the North Carolina coast Thursday afternoon. Don't pay too much attention to the landfall timing since this is a subtropical system. With a subtropical system, the strongest effects can be quite a ways from the circulation center. 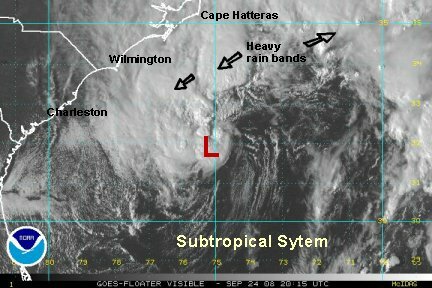 The Subtropical / Nor'easter system is centered about 215 miles southeast of Wilmington, NC. The latest I.R. satellite imagery now shows that convection is trying to build near the center of circulation. We still think that this Nor'easter has a chance to be classified as a subtropical storm before landfall this afternoon. Once again, it will make no difference whatsoever if it is classified. The effects are the same. A bouy in Onslow Bay had seas up to 14'. Another buoy off of Cape Hatteras was a little lower. Seas are up to 20' farther offshore. Right now, winds are gusting to 40-45 mph on the Outer Banks with gusts near 50 mph just offshore. So far, the heaviest rain has been just offshore with the doppler radar estimating 15" over 100 miles east of the coast. On land, the heaviest amount has been about 1" southwest of Wilmington. The forecast calls for the low to move northwest then west, fading away near Charlotte, NC. The speed is a little slower, with a landfall now near midnight Friday. So, it has about 24 hours over water. Look for about 1-3" of rainfall into North Carolina with the low. Isolated amounts may approach 5" near the coast. Farther north with the overrunning, a solid 2-4 inch total can be expected in southern New England. New York City and Long Island may expect 1-3". Surf will be 15-20 feet today on the Outer Banks. 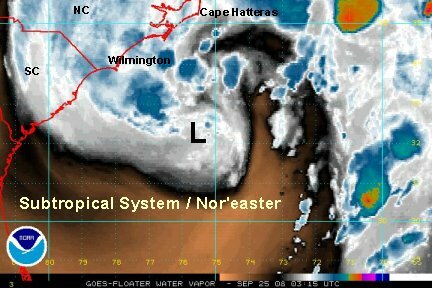 The Subtropical / Nor'easter system is centered a about 135 miles southeast of Wilmington, NC. It is moving northwest and should make landfall in a little over 12 hours. 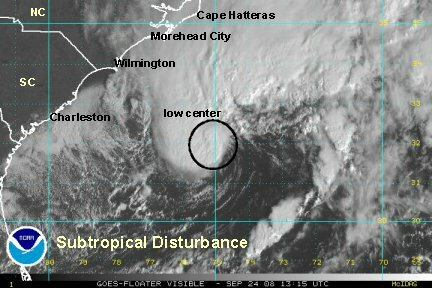 Convection is wrapping around the center, so we still think that it should be classified as a subtropical storm instead of a Nor'easter now. Our guess is that it will be given a name later today. The worst weather is now in two locations. 1) On the southwest side of the storm and 2) the Mid-Atlantic coast. The Mid-Atlanic coast from northeast NC to Delaware is seeing the rain pick up, with the heaviest on the Virginia coast at this time. A sampling of buoys and onshore locations showed that seas off of North and South Carolina are near 14-15' with winds gusting from 50-55 mph. Coastal winds are lower, gusting to 40-45 mph. Virginia Beach had a gust to 43 mph recently. Rain is still expected to pick up across the Carolinas this evening, although the heaviest rain will move up the Mid-Atlantic coast from Virginia to New Jersey today and into southern New England by Friday. Rainfall total are still expected to be in the 1-3" range. We definitely think that this system has gone from Nor'easter to a subtropical storm. Deep convection has built on the western side of the storm. This is a tropical feature with convection building near the center of circulation. So the system has both tropical and non-tropical features, thus it should be named a subtropical storm. NHC still has about 8 hours to name it before it makes landfall. According to their tropical maps, they give it a 20-50% chance of being named. At this time, it is centered about 100 miles sse of Wilmington and is moving wnw. It should make landfall near or just after midnight near the North Carolina and South Carolina border. This is almost the same location that tropical storm Hanna made landfall a few weeks ago. Rain has moved northward to New Jersey. It extends southward to South Carolina. Doppler radar has estimated 1-1.5" of rain on the southeast North Carolina coast. Doppler estimates range from 1-2.5" from extreme northeast North Carolina to the eastern shore of Maryland. After consulting with several colleagues, it was unanimous that this was an unnamed subtropical storm. The system actually did break off from the frontal boundary and developed convection around the core before the circulation. The kicker was that the Hurricane Hunter measured a 5 degree Celsius difference between the core and outer zone. It had a warm core! We think that NHC will make this a subtropical storm in the post season. The no name storm made landfall at 12:30 am edt and is now winding down and will continue to bring rain to the Southeast U.S.. Overrunning rain will continue in the Northeast with the front and the passage of tropical storm Kyle. This will be the last update.